Why Should I Be Concerned About Xenoestrogens? Xenoestrogens wreak havoc on your hormonal balance and endocrine system and can create numerous problems. Recent research indicates that xenoestrogens are affecting the world we live in, from male alligators unable to reproduce to parabens linked to breast cancer in women and testicular cancer in men ages 15-40. Many hormone disrupting chemicals, like bisphenol A (BPA), also disturb your thyroid's normal function. Additionally, endocrine disrupting chemicals may cause endometriosis, fibrocystic breast disease, ovarian cysts, migraines, infertility, breast cancer, reduced androgens, gynecomastia (enlarged males breasts), prostate cancer and even behavioral changes. The effects of xenoestrogens are world-wide and affect wildlife and humans alike. Where Do Xenoestrogens Come From? Most personal care products like shampoo, lotions and deodorants are riddled with xenoestrogens that come in the form of phthalates, parabens and Triclosan. These and other hormone disrupting chemicals are used by manufactures because they make the skin soft, provide extended shelf life preservation and allow scents to be long lasting. Unfortunately, many personal care products also come packaged in BPA/BPS or phthalate laced containers that can leach additional estrogenic or antiandrogen chemicals that are geno and cytotoxic and predispose cells to be cancerous. Household cleaners, especially ones that claim to be antibacterial, contain ingredients like Triclosan, which is a know hormone disruptor. There are countless studies on the harmful effects of endocrine disrupting chemicals and yet these chemicals continue to be unregulated by governments and used by manufacturers. What Can I Do to Avoid Xenoestrogens? Zero Xeno exists to create a xenoestrogen-free world! The Zero Xeno Movement aims to raise awareness about harmful xenoestrogens found in products the average consumer uses every day. Individuals who join our Movement learn where these harmful estrogen-mimicking chemicals are hidden and how easy it is to switch to products that are natural and free of endocrine disruptors. 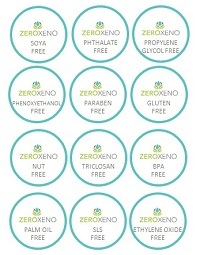 Zero Xeno’s mission is to educate consumers how to make informed choices and help them avoid xenoestrogens. We focus on teaching people how to read ingredients and check labels so that they can identify products that may harm their health. By limiting exposure to xenoestrogens, we can achieve a xenoestrogen-free world together! Join The Zero Xeno Movement today! All Zero Xeno (ZX Enterprises Inc.) products are for external use only. All advice and information posted on this website is from personal research and/or experience and is intended for general educational purposes. Our intent is not to diagnose, treat, cure or prevent any disease. The information on our site is not intended to be a substitute for professional medical advice related to specific medical conditions. We cannot diagnose illnesses nor confirm any claim as to therapeutic safety, effectiveness or course of treatment. Always seek the advice of your physician or other qualified health professionals for any concerns regarding your health. Only your physician can provide specific diagnosis and treatments. Please refer to our full Disclaimer for more details.